Is it Possible to Have Lounge Access on Arrival, or Only Departure? Flying [American] first class [New York JFK] – London Hea[throw] and wondering about lounge access on arrival and your recommendations. Also, does it matter whether I check or carry on luggage. Travelling light. I like this question because while it’s specific to his situation, and I’m going to give him the specific answer, it actually raises a broad question that comes up quite often — which is that many people want to access a lounge on arrival at their destination rather than just prior to departure, and the rules for whether they can do so vary a lot. The biggest factor that will dictate lounge access is where the lounge is, and where you’re going to get dropped off from your flight. When you fly from one US city to another, you get off the plane and you’re in the terminal. You can walk up to a lounge and enter. In other words, you can physically reach the lounge without difficulty. Then whether or not you can get into the lounge is going to depend on the particular lounge rules. Star Alliance and oneworld rules, if you’re relying on those for access, both say that you must be departing on a flight in their alliance to use a lounge. In practice though I’ve almost never been turned away with an eligible boarding pass on arrival, if I could access the lounge. When you access a lounge based on a paid lounge membership you can certainly use it on arrival — you don’t even need to be flying same day, let alone on a given airline, if you’re accessing it based on a US airline club membership. When you fly into the US from abroad (other than from places that have immigration preclearance) you go through immigration and customs and then you are landside. So whether or not you can access a lounge that is past security depends on whether you can go past security. Lounge members can often arrange a pass through the airline. But outside of that, if you don’t have a departing boarding pass for that airport and that day, you can’t go through security to get to a lounge. Let’s look at a place like Singapore. You arrive in Singapore, you get off of your flight, and since security is at each gate you are inside the terminal and can access any lounge without difficulty. The same is more or less true in places like Bangkok and Kuala Lumpur. In Hong Kong, though, you can either go through immigration or transit security. To reach departure lounges you have to go through transit security. And you need a departing boarding pass to do that. In London you are going to need to clear security after you arrive in order to reach departure lounges. So if you do not have a connecting flight, you can’t use those lounges. However American Airlines does have an “Arrivals Lounge” in London (and for that matter Cathay Pacific has one in Hong Kong) and it’s designed precisely so that arriving passengers can have some coffee, some breakfast, shower and change after their flight before heading straight to meetings. I really like arrivals lounges for early morning arrivals, since if I land at 6am or 9am even if I don’t have to be somewhere immediately my hotel room may not be ready if I turned up straight away. I don’t have to wait for that shower, which can make a huge difference after a long overnight flight. 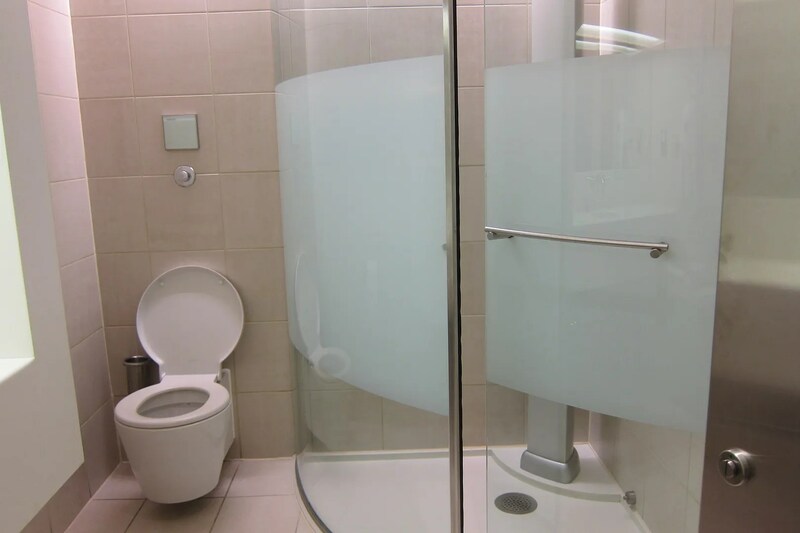 The American lounge at Heathrow has a ‘pass through’ in the door to the shower rooms. 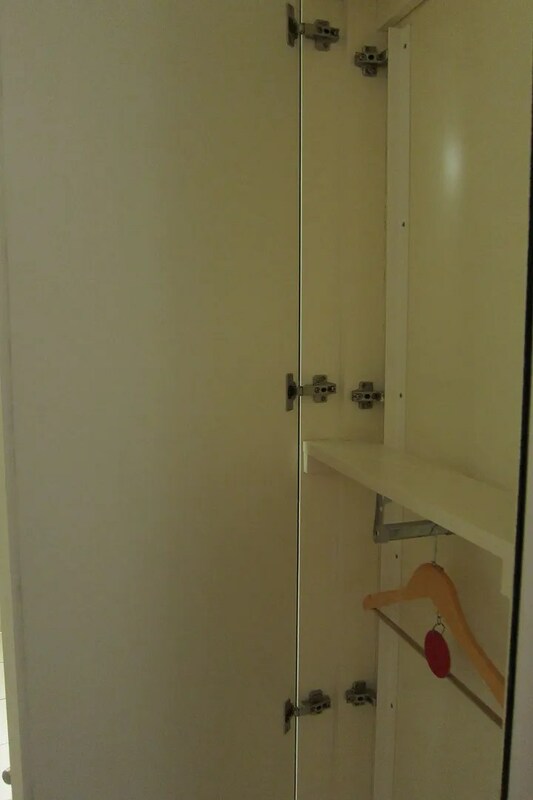 Place clothing in there while you shower. Press a button to let staff know you have done so. Then they will press the clothes while you get ready and place them back inside. When you’re ready to get dressed you take your clothes out of the door, ready to wear. If you are arriving at an airport and not connecting to another flight, your first bet is an arrivals lounge if one exists. If you want to access a departure lounge on arrival, and you’re not taking another flight, the question is whether or not you can reach the lounge. Then once you reach it, will they give you access? If it’s based on a membership they will. Most airlines will grant their own passengers access based on an eligible boarding pass even if their rules say otherwise. You can use Lufthansa first class lounges with an arriving first class boarding pass, for instance. I love arrival lounges after international flights (precisely when you need them) but few are located in a location that you can access after deplaning, i.e. landside. Also many of the arrival lounges close too early (usually 1-2pm) which makes them useless for passengers arriving later in the day. BA has an arrivals lounge in T5, as well. But they’ve made quite sure nothing is easily portable (cans, bottled water, etc.). Still a welcome spot. I am always turned away from United Club on arrival using A3 *G to enter. We have this problem. Arriving FRA on Singapore in First Class Suites. Connecting to LH Coach to Edinburgh. No lounge access for us in FRA – even tho arriving on their partner in FC! Fortunately I have the United Club Card so I can use the LH lounge as a Star Alliance partner. But still amazed. LH has an arrivals in FRA and I’m sure muc as well. I believe it is landslide in fra, at least that’s what I have to tell people who upgrade into City from M.
In 2010 I flew ORD-LHR-MAN in F on an AA award. After ORD-LHR in F, I presented my inbound AA F boarding pass to get into the Concorde Room in T5 before my connecting flight on BA to MAN in Y. No issues. I believe you can use air canada maple lounge in Frankfurt in that case but not sure. @Steven: Lufthansa has an arrival lounge at FRA for Business and First class passengers with showers, breakfast. After exiting immigration on arrival level, it’s all the way to the right. Some partners are paying for access for their premium passengers, some aren’t, so you have to check.. *A Gold doesn’t help. if you are arriving in HK for CX arrival lounge anytime between 6-9am, be prepared for at least an hour wait to use the shower. I’ve been turned away a few times in FRA trying to use the LH lounges as *G on arrival. BA has the most wonderful massages (and maybe shaves) in their first lounge in Heathrow. There are 2 in T5 but I think only one has the massages. It’s best to book them ahead of time. Along the same lines of the original question….what if we have checked luggage? We’ll be flying into SFO and would like to experience the Centurion Lounge, but we’re concerned that our luggage might not be at the carousel once we’re done. Any advice? Thank you for your time. As far as you know, if arriving into TBIT at LAX (BA F), is it possible to get into the new Qantas First lounge if I have a connecting flight on AA (leaving from T5)? Do I have to clear immigration and then clear security back into the terminal, and if so would they even let me in if my flight isn’t departing from that terminal? @David I call your 1hr wait and raise you CDG Terminal 2F lounge on a weekday morning. My last flight in that lounge I couldn’t whittle down the waiting list to take a shower even with a 2.5 hour transit. Beware. Admirals club membership will not get you into the arrivals lounge at LHR T3. You must be arriving in F/J, or be Explat. FYI: LH allows arival access to their lounges with their BP (not only Welcome Lounge in FRA but also FCL, Senator and Dusiness lounges). @TK I do not think you’ll be able to do this. You have to clear immigration and go back through security and I don’t think the TBIT will let you through with a boarding pass for another terminal (although they may not notice). New Hamad International airport in Doha has arrival lounge. We landed around 6:00 AM from PER on QR and too early to check in to our hotel. The arrival lounge is right outside after you clear immigration. They serve hot breakfast or you can order from the kitchen. They even have dedicated room for those who smoke. I have a similar situation coming up later this year and I’m wondering if anybody could share some insight. My wife & I will be flying AA Business JFK-LHR and then continuing on BA to PRG in economy. What would be our best option for lounges for the few hours that we have to kill between flights? Thanks! This is exactly the information I’ve been looking for. I’m flying SQ first class on an award ticket from NRT-SIN, and I’m wondering how successful other travelers have been with gaining entry to the first & business class lounges upon arrival, including The Private Room (T3). I do not have an additional departing flight out of SIN but hoping to freshen up a bit after the flight. Thanks for this. What’s the best bet for 2 hours in HKG arriving on business and leaving in coach? Thanks for this. What’s the best option for 2 hours in HKG arriving on CX business and departing on CX coach? We have a CX J flight HKG-BKK in a few weeks and we’ll only have backpacks with us that we’ll be carrying aboard. Do you think we will we have access to CX’s new lounge on arrival? It’s new, so I haven’t read any reports either way. Supposedly any same day boarding pass will allow access to any terminal at LAX. A few weeks ago, I was on a AA flight from T5 and wanted to check out the Qantas lounge. No problem clearing security at TBIT, although no pre-check. No problem gaining access to the lounge and exiting TBIT was a breeze, unlike LHR or HKG. The BA arrivals at T5 is hard to find especially after 21 hours flying from Australia and/or dragging luggage for a 3 week European holiday! It’s open to QF gold and above with a dinky little dining room for platinums or Fs. 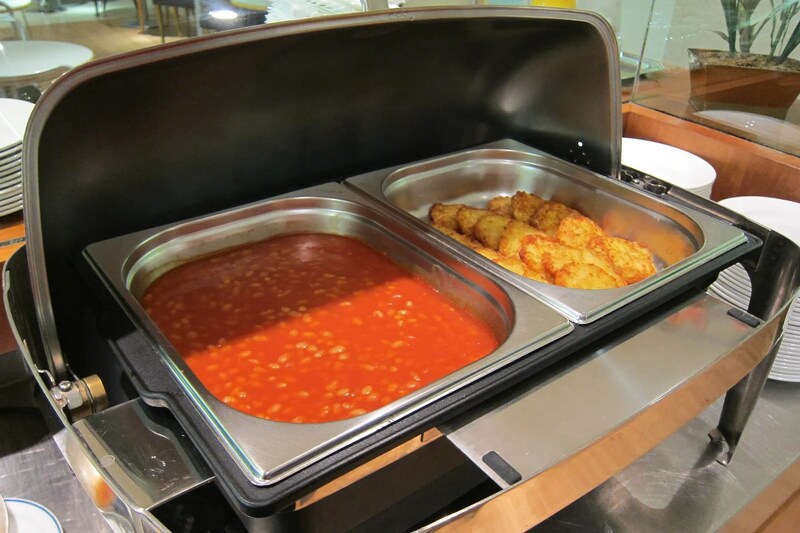 The staff take your order then go out to the Bain Marie’s in the main part of the lounge to plate up and bring it back in for you! Hilarious. But great to have a shower before heading into the city or Eurostar. If arriving on ANA F NRT-SIN connecting on a separate ticket in SQ coach (8 hours layover), will I have access to any lounges in SIN? Hi Gary, I have a question about lounge access. FYI: The Munich Airport does have lounge access for Priority Pass Members. However, it’s in T1 Arrivals area and you’ll have to go through the security and passport checks. Also, just so you know, it’s the Atlantic Lounge by Emirates…so don’t be misled and let the signs lead the way. Zurich airport has a Swiss Arrivals lounge with showers, breakfast, quiet rooms and movenpick ice cream! “Let’s look at a place like Singapore. You arrive in Singapore, you get off of your flight, and since security is at each gate you are inside the terminal and can access any lounge without difficulty. For Bangkok, this is simply wrong. When you get off an international flight at Bangkok, you can go to toe loo or go through customs. There is zero chance to go to a lounge. I am surprised Gary would be so wrong. Yes, I did not mean to say Bangkok when I wrote this a couple of years back..
Hi Gary, if arriving at PHL in BA F and connecting to AA domestic flight, would we have access to the BA lounge after clearing customs and getting back into the terminal? We have a long layover there and would rather spend time in the BA lounge than Admirals Club. @Cam British Airways has always provided me lounge access based on my arriving boarding pass in the past. Will I be able to use the Virgin Atlantic Revivals lounge in LHR if arriving LHR in business, but continuing on VA in economy?